Or should I just title this post “Quite Simply the Easiest Gluten-Free, Dairy-Free, Egg-Free, Nut-Free Chocolate Covered Banana “Cake” Pops, Just Without the Cake Part”? But, I suppose that would make for a ridiculously long title. With dinner time fast approaching the other night, the bags from my trip to Trader Joe’s only moments before were getting unpacked hastily in between my mealtime prep. Things do not ever end up where they belong when I am in multi-tasking mode in the kitchen (or anywhere else in the house for that matter). My dark chocolate bars that I just purchased somehow landed in the fruit bowl alongside my big bunch of bananas. Not where I normally store my chocolate. But not time to worry about that now. I had hungry boys circling the kitchen. As dinner started simmering on the stove, it hit me that we had two birthday parties coming up. And one was serving cake pops! Since we always come to parties with our own gluten-free cupcakes in tow, I usually keep a stash of home-made unfrosted cupcakes in the freezer. Then, right before a party, I let the boys frost their own cupcakes and then go crazy with our natural Let’s Do… Organic Sprinkles. They love this little ritual. 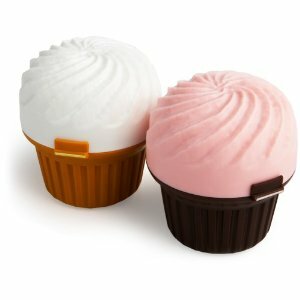 Once their masterpieces are finished, I put them in these really cool cupcake holders…perfect for kids with food allergies who like to tote their own cupcakes. Side note – these holders are great. They keep your cupcake suspended in the middle and the frosting stays perfect and never gets smooshed. But, because cake pops were on the agenda for one party, I needed to come up with a similar treat even though I did not really have time to go through the cake pop process. But then? My eyes brushed over that fruit bowl. Remember that one where the chocolate was mingling with the bananas? And it hit me! 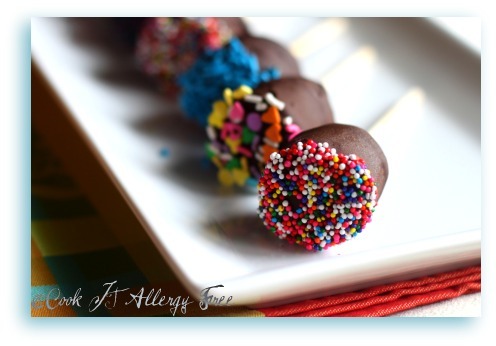 Chocolate Covered Banana “Cake” Pops – Sans the Cake part. I could make them look just like a cake pop, but instead of cake in the center, it would be a banana piece. Even better, by using my Vegan Chocolate Bar for the Chocolate covering, these could be Gluten-Free, Dairy-Free, Egg-Free, and Nut-Free! And the kids could still do their own decorating with our natural sprinkles. And, yes. I absolutely know that this is not some brilliant revelation! I know I am not the one to pioneer a chocolate covered banana. My point here? I can make them look just like cake pops in one tenth of the time, using only three ingredients, and my kids think they are getting a wonderful treat. And I know that they are getting a little punch of potassium from the banana and some antioxidants from that dark chocolate. The end result? The kids loved them! And the best part was that I packed them each three “pops” to bring to the party. They felt even more special that they got to have more than one! And even better was that these were actually a HEALTHY treat! And really. That is the best part for me. 1. 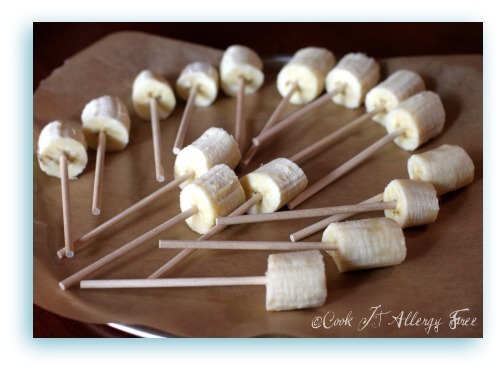 Place the pointed end of a wooden skewer, or your cake pop stick, into the center of each banana piece. 2. Place banana pieces on a piece of parchment paper on a plate and freeze for about 2 hours, or overnight. At this point your bananas should look like the photo at the bottom here. 3. Place chocolate in medium heat-proof glass bowl and place bowl over pot of simmering water. Make sure bowl fits snugly on pot and that bottom of bowl does not touch water inside – just rests on lip of pot. Stir chocolate constantly with rubber spatula until melted, shiny and smooth. Do NOT allow any water to get into chocolate – chocolate will seize immediately! 4. Remove banana pieces from freezer. Use a spoon to pour chocolate evenly over each banana piece. DO NOT dip banana into chocolate. This will cause your melted chocolate in bowl to harden. Using back of spoon, spin banana piece while smoothing chocolate. Make sure to cover the top of the banana. 5. Before chocolate hardens, dip just the tops of the covered banana pieces into your bowl of sprinkles. Then place on parchment paper. Once all bananas are dipped, place back into freezer to harden. Store in freezer until ready to use. **For more information on Organic Dark Chocolate, see what Jenny, of Nourished Kitchen, has to say in a recent post about the Love of Organic Dark Chocolate. P.S. Do not feel sorry for my kiddos. I did not trick them. They knew there was no cake hiding under that chocolate and they actually loved the bananas in them. My kids love chocolate covered bananas – well they love bananas in general! We joke that we should move somewhere tropical and get a banana tree because they literally eat like 12 a week. I think I’m gonna do this with them tonight – thanks for the idea! mmm these look delicious 🙂 Starbucks has cake pops now, but they aren’t gluten-free. So festive too! Thanks, Emily! I did not even know that Starbucks was carrying cake pops. Maybe they will start making gluten free ones soon!! I’m so happy to have found your blog! My son has a bunch of food allergies and I’m always looking for new treats for him. I’m going to share this on my Half Assed Kitchen Facebook page and hopefully bring you a chunk of new traffic. Thank you thank you thank you! Hi Half Assed Kitchen!! So glad you found me! 😉 Thank you so much for sharing these on your facebook page!! So appreciated! I LOVE your site. Too fun! Great to get to know you! Lex, you will love those cupcake holders. They suspend the cupcakes or muffins perfectly – never smooshed! How cool, by the way, that the nurse of the school has Celiac disease! Well, I do not mean that it is cool she has it. But it is cool that she will “get” what M can and cannot have! Thanks Christine! The sprinkles were courtesy of the kiddos!! They were a fun touch! Shirley, I am so with you! The regular cake pops are so time consuming! These, on the other hand, are so easy peasy!! ROFL … well, “Mom,” that’s EXACTLY my kind of reading! Except it wouldn’t put me to sleep; instead I’d be riveted! Great idea! My daughter will loves these! Thanks Sarah! I hope your daughter likes the chocolate covered banana pops! They are seriously the easiest quickest thing to make! Heidi, I love the double meaning of R.O.C.K. LOL!!!!! And, thanks, my friend!! And since you are cutting out chocolate right now, I do think that the carob chips would be a cool touch here! Can you be my mom if I’m older than you? It’s not by much. I agree with Shirley and Lexie. Or at least, can you be another mom to Max? He would love all of the treats that you make that I just don’t have the energy to do. In fact, I think I might make these today. Don’t have sprinkles, but no one here will care. Nice and easy. Well, Tia, it looks like I just gained three new children: you, Lex, and SHirley. I have always wanted a girl!! Yay! And now I get to miss all of those turbulent teenage years of parenting since you are all beyond that (oh, but not by much, of course). I bet Max would love these! He can even totally help! Hope you all are feeling better!! Remember what i said! AZ would dry you all out! I love these! I agree, who needs the cake and this is so much healthier. The kids are getting a wonderful treat. At first when my son went gluten-free I thought he would miss out on treats, but now my other kids think my son is getting special treatment with all his gluten-free, healthier treats! Jeanette, exactly! Who needs cake when you can have a banana? LOL Not sure how many other people might agree with this, but at least my kids are still humoring me! 😉 And I agree. Often my kids gluten-free treats are WAY better than the store-bought gluten filled ones that are often at the birthday parties we go to! these look fantastic! I have been telling my kids we should make banana choc pops and now I am convinced!!!! yours look great. Hi Mixing Bowl Diary! Thanks so much! 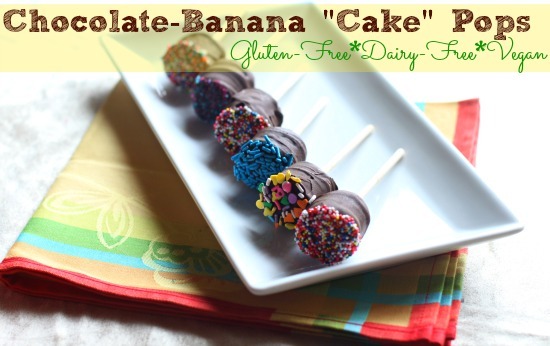 You should definitely make these choco covered banana pops with the kids! They are so easy and they will have a blast helping you out! This is FANTASTIC Kim. I love it. The whole cake pop thing has really intrigued me, but also scared me! This totally gets me out of making them. I love it so much! Callum will love it too. You rock! We do that cupcake in the freezer thing too – but now I need those containers! Thanks Maggie!! The cake pop thing can be a little intimidating, but mostly it is just really time consuming. These are just so much quicker and easier!!! And you have to get those cupcake containers! They are so nice for toting our frosted cupcakes! Thanks for this simple, healthy idea! I will have to stop using my big marshmallows and change to bananas (and maybe strawberries?) I am also on a mission to find those adorable cupcake holders locally… Thanks for the inspiration! Katie, those big marshmallows are still great covered in chocolate, though! I have to admit that I just may have a small addiction to marshmallows! LOL And strawberries are just as yummy too!!! I hope you find those cupcake holders, by the way! You will love them! I will be steeling this idea SOON.. my daughter is going gluten-free on saturday. thanks for the tip! Also what a GREAT recipe for a linky party! We are doing CHOCOLATE… CHOCOLATE and MORE CHOCOLATE at THIS WEEK’S CRAVINGS Linky Party and we would love to have you link up this awesome recipe! Hi Tina! Report back on how it goes with your daughter going gluten-free this weekend! I am sure it will go wonderfully! And thanks for the link to your Chocolate Linky party! I will go link up in a bit!! Wow, wow and wow. LOVE this. SO much. School birthday party coming up in a few weeks for a class with gluten, dairy and nut intolerant kids. Now I know what to do. Perfect!!!!! Yumm, love frozen bananas, I like to dip them in peanuts too. Hi Intolerant Chef! Thanks so much! Ooh! And I love them dipped in crushed peanuts or peanut butter too!! Love it, Kim! Holy cow, what a great idea! I haven’t tried making cake pops (yet, still on that long list of things to try), but I love this idea, and what kid wouldn’t love to eat it? Anything eaten off a stick is fun, right? Thanks for sharing! Alisa, i have learned not to trick them. Every time I do it just backfires on me. LOL I just told them that the bananas would make them so much healthier than their friends and would give their brains the right kind of energy. Teehee… OH well. I will do what I can while they are still young enough to believe me. I’m actually a big fan of ridiculously long titles. I like getting the whole story in a title, haha. What a pretty little treat. Thanks for sharing with the Hearth and Soul hop. What a neat & tasty idea! So, that your children would eat more fruit! hahahhahaha,..! they look ohh so tasty too! omg those are just way too cute. and? I HAVE THOSE SAME CUPCAKE HOLDERS. I have some in the freezer right now. I didn’t have the sticks so I used mini cupcake liners, I hope it works!! They came out delish!!!! Soooo much healthier than cakepops too!!! You are such a fun mom. Lucky boys. My hubby would love these. Kim – I love that you put the frozen bananas on sticks. Kids will go wild over these–they’re tasty and colorful. And, although I haven’t had cake pops myself I have to believe these are just as good…if not better. We are working on this dessert now. So easy! And looks yummy!